A goalkeeper is the key player of a team. To win a match, he take all necessary risks to prevent a goal. He need to move fast to catch the ball from different directions. To stop the ball, most of the time he use his hand. So he need to take extra care of his hands. A goalkeeper glove is the most essential gear of a goalie’s gear list. But as a goalkeeper, I know how difficult and important to find out and buy the best goalkeeper gloves with finger protection. Gloves not only protect goalie’s hand but also increase his/her confidence level by minimizing hand injury. To help you buy the best goalkeeper gloves, we make a list of 10 best goalkeeper gloves with finger protection. This list of best goalie gloves review will guide you to choose the perfect one for you. Renegade GK Goalkeeper Gloves are come with advanced Endo-Tek Pro fingersaves technology to protect your hand from injury. 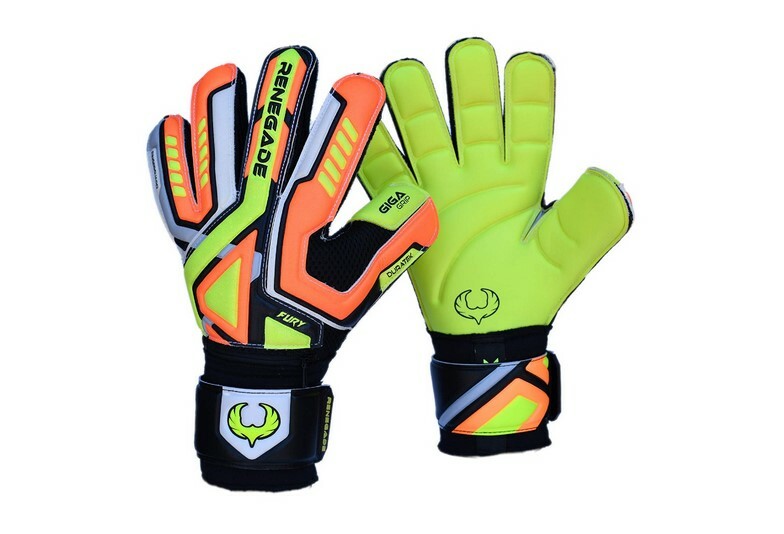 It’s beautiful design and bright color make it very attractive to all goalkeeper. It has 3+3MM latex on palm and backhand of gloves which provide an extra layer of protection to save your hands from high impact shots. It also has 3CM airpreen bandage and 3MM latex 3600 Dumbex wide strap for highest wrist protection. It’s finger protection is removable. If you don’t feel comfortable, you can remove them anytime. By maximizing your performance it will increase your confidence level. GK Gloves are made with high quality materials (in every step of it’s production) by following latest construction method to make it lightweight, comfortable and durable. 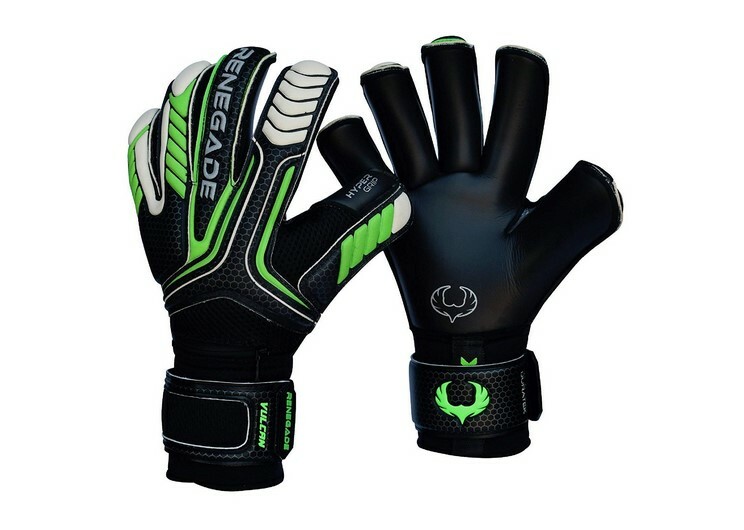 Renegade GK Fury Gloves are only available in one attractive color. Available Sizes: From size 7 to size 11. 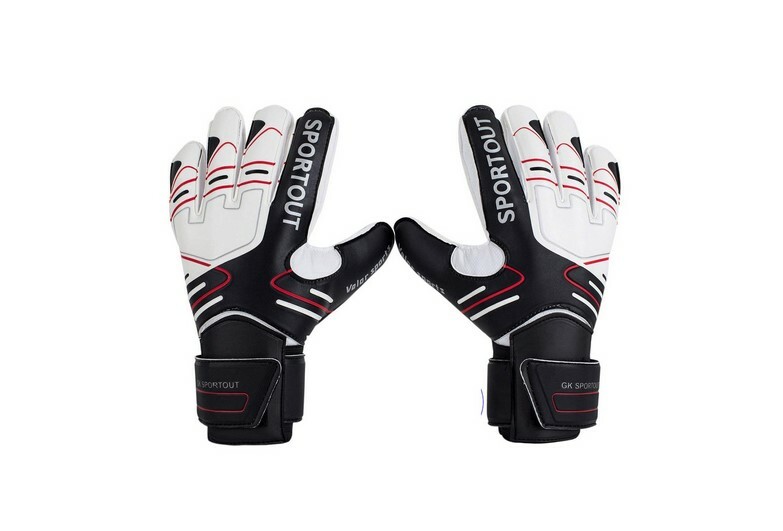 Sportout Goalkeeper Gloves are come with best finger protection system. It’s latest backbone finger-protection system will keep your finger save from all type of finger injuries during training and competition. To protect your palm, Sportout goalkeeper gloves are padded perfectly with high quality latex foam. These latex materials make the gloves slip and wear resistant. So it offer strong grip and best ball control. These gloves have double wrist safeguard system to protect your wrist from spraining. Sportout Goalkeeper Gloves are made with high quality EVA and Latex materials which make it lightweight, durable, sweat-free and breathable. Also the gloves are very easy to use and excellent comfortable. After every use, simply wipe the goalkeeper gloves with a piece of cloth before drying. Don’t use detergents and keep them away from direct heat. Sportout Goalkeeper Gloves are available in 3 beautiful colors (black, blue and red). Sizes: a) Size 5, Size 6 & Size 7 are ideal for kids/Youth. b) Size 7, Size 8, Size 9 & Size 10 are perfect for adult. Like all other Renegade GK Gloves this Renegade GK Vulcan Goalkeeper Gloves are come with advanced Endo-Tek Pro finger-save system. It will improve a goalkeeper’s confidence and performance by minimizing the possibility of injury. If you don’t need finger protection, you can remove them. They use German NB Hypergrip thick latex foam on the palm and Spanish thick latex foam on the backhand to ensure maximum protection during punching and high impact shots. For best wrist protection they also use 8cm bandage and (3mm Latex + 3600 Dumbex) broad strap. This Goalkeeper Gloves also offer 3D Airmesh body for excellent breathability. They use latest design, high quality materials and best construction methods to ensure it’s highest quality. Renegade GK Vulcan Goalkeeper Gloves fit well and very comfortable to wear. Vulcan Goalkeeper Gloves are only available in one attractive color. Blok-It glove is one of the most popular soccer goalkeeper gloves in USA for it’s great quality and very reasonable price. These gloves are perfect for both practice and serious soccer. They have built-in finger save. Blok-It gloves are nicely padded and made with high quality breathable materials to ensure great fit, comfortable feel and highest protection. It has good grip for perfect ball control. It’s stylish design and great comfort will keep you secure and confident in front of goal bar. Also it’s breathable materials will keep your hand sweat free all time. Blok-it Goalie gloves are beautifully designed to keep you secure from all type of hand injury. If you take care of them perfectly, they will last long. Clean them by wiping with a damp cloth after use and allow them to dry naturally. Don’t use detergent and direct water to clean them. 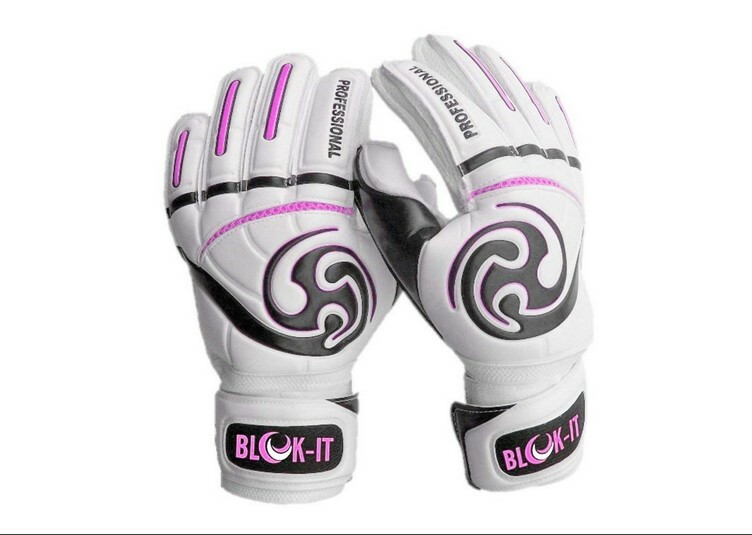 Blok-It Gloves are now available in 3 different colors (White & Black, Pink and Green). Hope you like our soccer shin guard review. 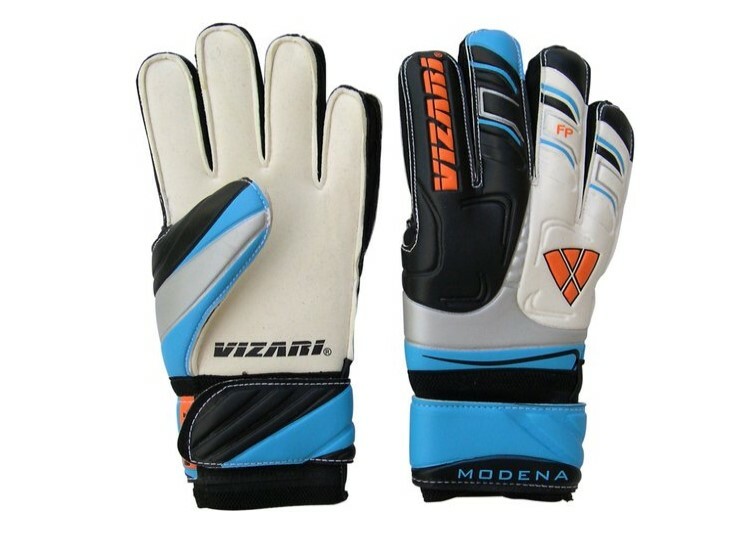 If you are a professional goal keeper, you can’t ignore Vizari Modena Gloves for it’s excellent quality and performance. It has amazing finger protection which is better than other expensive soccer gloves. They use 3MM latex palm to ensure perfect grip in all conditions. It’s backhand is padded with super soft foam which ensure good protection. It’s 8cm elastic fitted wristband will keep your wrist in perfect place to protect wrist and wrist joint from injury. Vizari Goalkeeper Gloves fits like perfection. Surely they will keep your hands sweat-free and comfortable for long time. They are best for their price and performance. 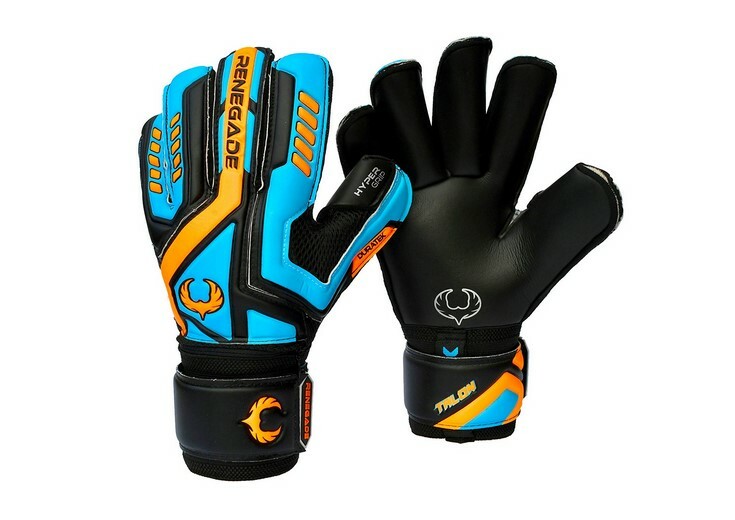 Renegade GK Talon Goalkeeper Gloves are designed to boost performance and maximum protection. Like other Renegade GK Gloves it also has removable Endo-Tek Pro fingersaves system. This gloves has German hyper grip 3+3MM palm and Pro-soft 3+2MM Latex backhand for good grip, comfort and durability. For excellent wrist protection it also has 8cm bandage and 3600 2-point broad strap. It’s 6D Airmesh body make the gloves breathable which will keep your hand sweat free. This well-equipped soccer gloves will increase your confidence level by improving performance. They have very attractive return and exchange policy. If they don’t fit with your hand or you don’t like them, the company will replace them or they will refund you. Be sure about your size before ordering to ensure perfect fit. Choose the right cut for maximum comfort and good fit. 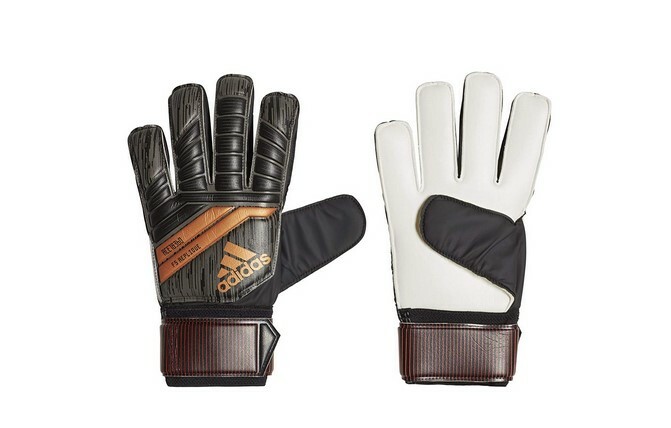 Adidas Performance ACE Fingersave Gloves are ideal for beginner goalkeeper. Adidas bring this gloves to protect goalie’s finger from high speed shot with advanced finger protection technology. It has latex palm which ensure good grip, soft feel and highest durability. It’s backhand is perfectly padded for extra comfort and flexibility. It’s elastic bandage ensure good fit and best wrist support. Adidas positive cut ensure comfortable and perfect fit. Adidas Performance ACE Fingersave Gloves are perfectly made for all weathers. Available Size: Size (9 to 12). 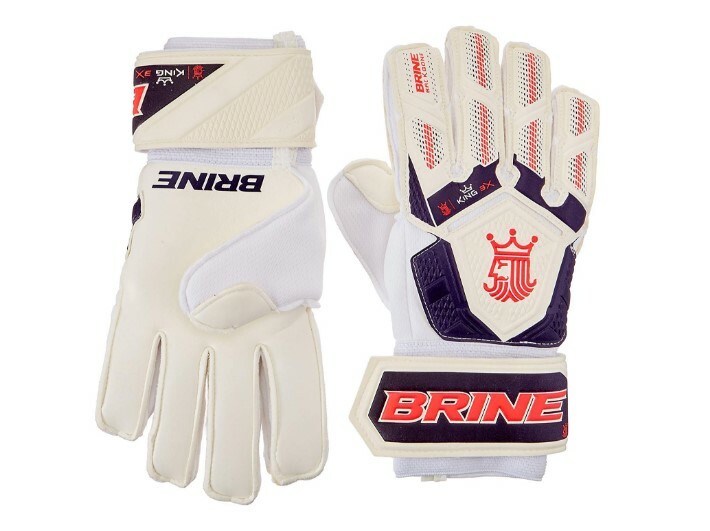 The Brine King Match 3X Gloves are come with latest backbone finger-protection technology. It features 3mm German latex foam palm which offer excellent grip, EVA backhand which make the glove very comfortable and flexible, EVA wristband which offer excellent support and breathable mesh body which keep hand cool and sweat free. It’s beautiful and modern design make it perfect fit. They are padded well to ensure highest comfort and maximum security. They are best budget-friendly goalkeeper gloves with finger protection. It you take care of them by following their guidelines, they will serve you long time. Available Size: Size (4 to 11). Available Color: Energy Red, Hi Lite/Vivid Cactus, Lime/Orange, Lime Green, Red/Black/White, Toxic, White/Purple, White/Silver/Gold. 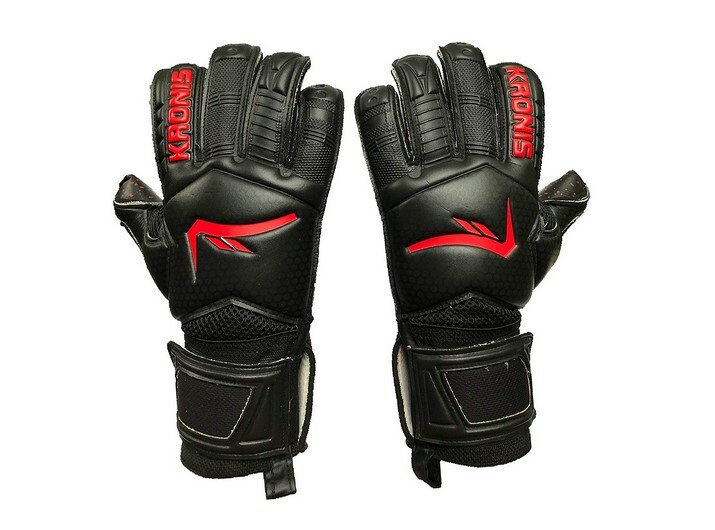 These KRONIS Goalkeeper Gloves are best professional level gloves which is designed to improve performance. It has some premium features. This gloves features a rolled finger-cut which provide a larger contact area between ball and latex. It’s supreme aqua latex palm offers perfect grip and durability in all seasons. Latex backhand make it more comfortable and flexible. It’s wrist bandage and wrist band offer a secure fit. V-notch at thumb offer easy and quick in and out. They don’t have finger-save because it’s design and construction keep your finger save without it. Kronis gloves are very durable and comfortable. Size: Available from Size 4 to Size 10. Color: 1 Black and Red combined color available only. The G2 Ortho-Tec Gloves are come with newly invented Ortho-Tec finger spines, which is best finger saves in the market. It provides excellent grip in both dry and wet conditions. Both palm and backhands are padded with G2 ultra-soft foam to make it more comfortable and flexible than other normal gloves. It’s dual loop system make it easy to put them on and off. One of it’s amazing feature is finger ventilation which will keep your hand cool and fresh all time. It’s advanced shock-shield offer additional protection during punching. If you take care of them according to instruction, surely they will last long. 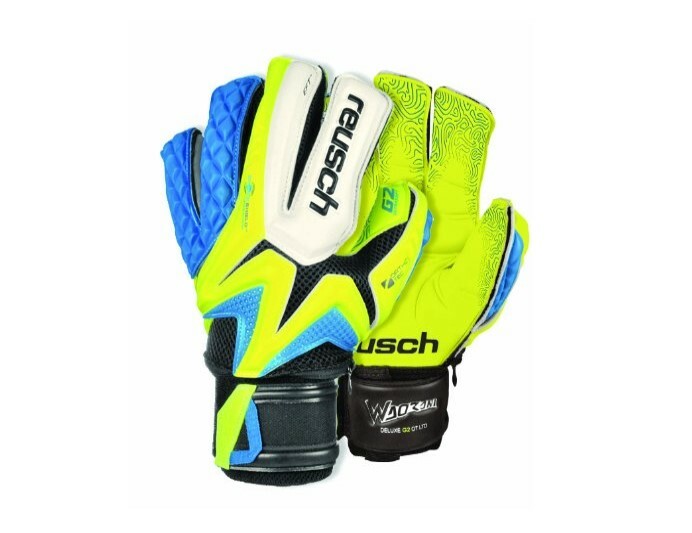 Overall Reusch Premium G2 Ortho-Tec is the best finger-save soccer glove. Size: Available from Size 7 to Size 12. Color: Only one attractive mix color. Buying the best goalkeeper gloves with finger protection might be the crucial task of one goalie’s life. To assist you, we have listed 7 essential features you need to focus on before buying a goalkeeper glove with finger protection. Finger Protection: The risk of finger injury is much higher than other injury in soccer. So when you go for shopping a soccer glove, you need to go have a look at glove’s finger protection system. How good it’s protection system is? Palm: Then you have to focus on Glove’s palm. You have to catch the ball with your palm and finger. Is palm offer good grip? Is it perfectly padded? Is it durable? Backhand: Backhand is important because it provides protection during punching the ball. Good gloves have latex foam backhand while normal gloves have single foamy layer. Wrist Support: When you look at glove’s design you need to focus on it’s wrist support. Is it able to contract with your wrist muscles perfectly? To protect your wrist, your gloves need to be capable to keep your wrist in place in all situation. Closure: Glove’s closure ensure easy and quick entry. Available closures are – Hook and Loop closures, V-notch closures and Bandage Closures. V-notch closure is the most popular one. Breathability: Next you need to focus on gloves breathability. Every goalkeeper wants to play a game without hand sweating. If your hand sweat, you will not able to save both easy and difficult shot. So buy a glove which is able to keep your hand cool and dry the entire time. Fit and Comfort: Carefully measure your hand size and watch the sizing chart before buying gloves. Gloves which are too big or too small both make travel to catch the ball. So you need a perfect fit gloves which will keep your hand comfortable and help you to perform best. 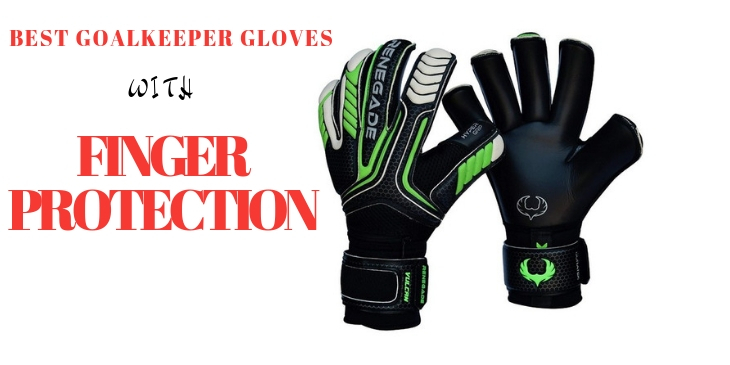 Hope this list of 10 best goalkeeper gloves with finger protection will help you to find out the best and perfect one for you. Which gloves you choose, make sure it’s fully capable to secure your hand. Tell us at comment section, which pair of best goalkeeper gloves with finger protection you choose to buy. Read our soccer ball buying guide.